Soul Serenade: The Cookies, "Chains"
The history of the Cookies goes all the way back to Brooklyn in 1954. It was there that Dorothy Jones and her cousin Beulah Robertson got together with Darlene McCrae. Robertson didn’t last long with the group however, and she was replaced Margie Hendricks two years later. The Cookies, like so many before and after them, made their debut at the Apollo Theater’s amateur night. The reason that singers throughout the decades have risked the wrath of Apollo crowds is the hope that they will be discovered. It worked just like it was supposed to for the Cookies. Jesse Stone of Atlantic Records was in the theater the night they performed, and in 1955 he invited them to do some recording for the label. The Atlantic sessions resulted in the Top 10 single “In Paradise” in 1956. The Cookies were not only making their own records during this time, they were singing backup on records for other Atlantic artists including Ray Charles, LaVerne Baker, Ruth Brown, Joe Turner, and Chuck Willis. Eventually the work with Ray Charles led to Hendricks and McCrae, along with Pat Lyles, forming the Raelettes in 1958. Jones wasn’t deterred however, and three years later she introduced a new Cookies lineup that included Darlene McCrae’s younger sister Earl-Jean, and another Jones cousin, Margaret Ross. This was the Cookies lineup that found success, not only recording their own hits, but appearing as backup singers on hit records like Neil Sedaka’s “Breaking Up is Hard to Do,” and on Carole King-Gerry Goffin demo sessions for Don Kirshner’s Aldon Music. That’s the Cookies singing backup on Little Eva’s “The Locomotion,” written by Goffin-King. It wasn’t all background work for the Cookies though. In 1962 they scored a Top 20 pop hit with “Chains,” a Goffin-King song that had originally been recorded, but not released, by the Everly Brothers. The record reached #7 on the R&B chart, and #17 on the Billboard pop chart. Today, many people know the song from the Beatles cover that was released in March, 1963. The best was yet to come for the Cookies. In 1963 they hit big with “Don’t Say Nothing (Bad About My Baby),” another Goffin-King song. That’s Earl-Jean McCrae, the group’s lead vocalist, issuing the legendary warning “So girl you better shut your mouth!” The record shot to #3 on the R&B chart, and #7 on the pop chart. The follow up record, “Girls Grow Up Faster Than Boys,” was the last Cookies chart hit, reaching #33 in late 1963. Seeking another hit proved elusive. The Cookies released records under several pseudonyms for several labels. These credits included the Palisades (Chairman Records), the Stepping Stones (Philips Records), the Cinderellas (Dimension Records), and the Honey Bees (Fontana Records). Nothing made much of a dent. McCrae left the Cookies in 1965. She recorded a couple of solo singles, including the original version of “I’m Into Something Good” (you guessed it, another Goffin-King song). The record went Top 40 for McCrae, but a few months later Herman’s Hermits took it all the way to the top of the charts. The Cookies had one more shot, releasing a record that was produced by the Tokens, in 1967. 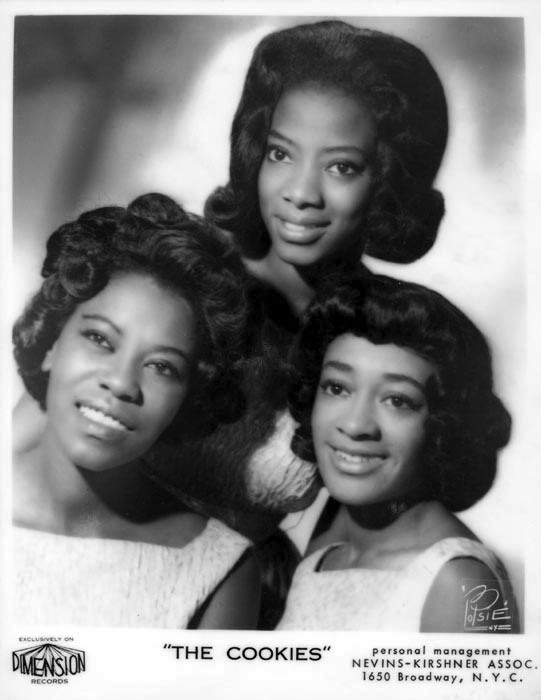 Darlene McCrae returned to the group for that record, taking the place of her sister. The Cookies were often seen as somehow less hard-edged and less soulful than their girl group contemporaries. They needed great songs to compete, and eventually their string ran out. They will always be remembered as one of the American groups that influenced the Beatles to the point that the British group covered one of their hits, a tribute that puts them in the company of soul giants like the Shirelles, and Arthur Alexander. The Beatles, that perfect hybrid of their influences blended with their original talent, went on to change the world.